Hydroponics has already established itself as the favorite “alternative” way of raising plants, but its cousin called aeroponics remains less known. Let’s learn something about this promising method. The roots are able to absorb much more oxygen and carbon dioxide, ensuring vigorous growth. Fine droplets of nutrients sprayed along the entire root system secures efficient nutrient uptake; aeroponics uses ⅓ the amount of fertilizers needed for hydroponics and soil growing. A wider range of plant species can be cultivated; while carrot and potato are not suitable for hydroponics, they can be grown within an aeroponic setup. You can grow more plants in a small space. There is no need to buy growing medium of any sort. As you can see, aeroponics has a lot to offer. Even NASA used it in its plant-growing space experiments in the 1990s, contributing to its popularity significantly. However, due to the need for pumps and automation, aeroponics systems can get expensive. Many people are turning to build their own DIY versions of aeroponic systems to save some money, to upgrade their maker skills, and for the sheer joy of building your own highly-productive system out of easily available components. 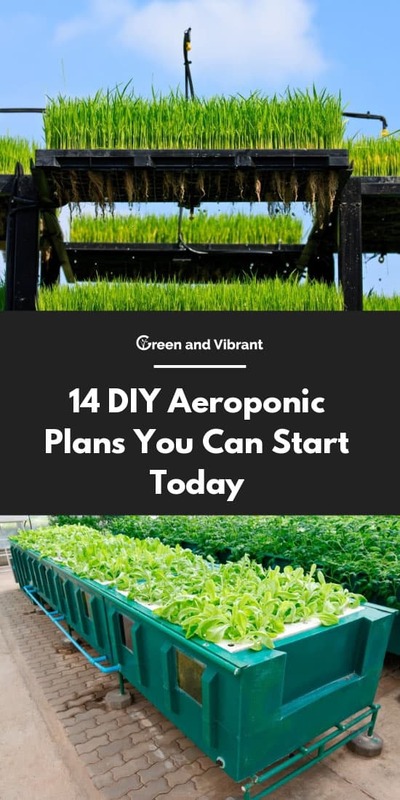 Here’s a list of 14 diverse aeroponic projects you can build yourself. Low-pressure aeroponic system is usually the first choice for beginner aeroponics enthusiasts. Although they are less efficient than high pressure systems, they are easier to build and maintain. This homemade design uses two 5 gallon buckets, PVC spray bars and misting nozzles. It is an upgraded version of the previous design, which guarantees it has been perfected and made more efficient. This is exemplified by the nice, large Helios Habanero plant that the author raises with his system. Garden Pool, an international public charity which researches and educates on sustainable ways to grow food, offers two detailed tutorials for simple aeroponic setups. The first one consists of a 30-gallon tote box with six sprinklers inside, and six holes for plants. It is a great option for cloning. The second project from Garden Pool - The Five-Gallon Bucket plan uses only about two gallons of water, making it much and lighter, compact and easier to manage than the previous design. It provides space for seven plants. The main piece of gear is a hydroponic pump with a riser and a threaded 360 sprinkler head. While you do your research, check out the instructions by Aeroponics DIY. While it doesn’t offer a highly detailed plan, it covers all the important aspects of the high-pressure principle that you should know. The video on how to make a high-pressure system is promised to come soon. Jason from Jason's Indoor Guide specializes in finding budget-friendly, efficient solutions for hydroponic and indoor gardening. His take on aeroponics is quite interesting. 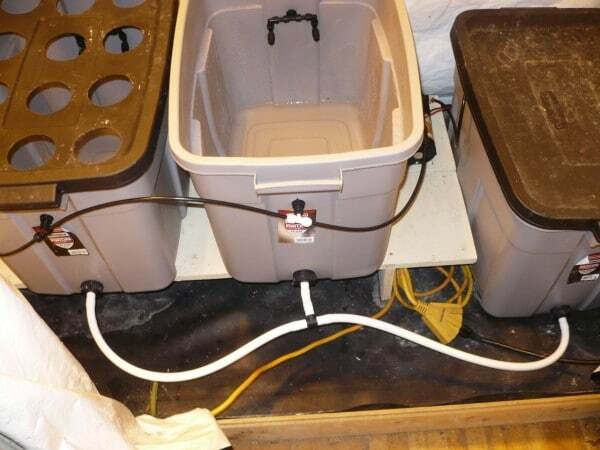 In this instruction, he presents a DIY version of a store-bought system based on a series of small rails and a 20 gallon reservoir. He created his own rails (or channels, as he calls them) out of the larger-diameter PVC tubes, while the narrow tubes are housed inside them to bring in and spray the nutrient solution. Also, Jason has focused on avoiding the most common problem of aeroponic - the clogged spray nozzles. Another simple tote box low-pressure setup, this time with an emphasis on maximizing the number of plant sites - which makes it ideal for cloning. The video tutorial is short, clear, and neat - just like the project itself - and tells you everything you need to know about a simple low-pressure setup without a single spoken word. The this DIY high-pressure system is the first pyramidal design on our list. It was created with an intent to save space while maximizing the number of plants you can grow. In his last tutorial video, the author says that he believes that “people that are more successful with this kind of work are the people who fail a lot in their experiments, and learn from those failures to get to something that eventually works”. That is why he gladly shares the problems he encountered while making his system, and also points out what could be made better. His experience makes this particular video a precious resource to learn from somebody’s else mistakes. And fortunately - everything works out in the end. This simple and neat aquaponic bucket is easy to build. What makes this plan stand out is the utilization of Raspberry Pi to control the camera function. 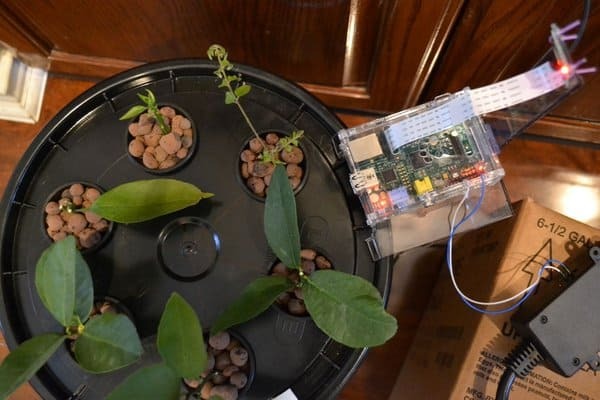 The camera simply takes pictures of plants, but as the author states, the project can be advanced further by utilizing Raspberry Pi to control pH, send emails and similar useful functions. Art Garden is a small family business that on sustainable gardening, including vertical aeroponic systems. Although they do not offer full free tutorials (at least not yet), you should definitely take a look at these two great videos, as they reveal enough about Art Garden’s innovative, inspiring aeroponic practices, so they will surely be practically useful. This is a tried-and-tested and very well thought-out, yet it still fairly simple high-pressure system. It uses 18-gallon Roughneck Rubbermaid totes as a reservoirs, and is equipped with Aquatec 8800 booster pump, with misters in a closed loop. What is perhaps the most interesting is the way the author deals with clogging. He used a fuel filter bag to keep the dirt out of his systems. The pores on these filters are 10 microns, they are made of polyester felt and can be washed in a washing machine. The author claims that with these simple and inexpensive filters the system becomes really low-maintenance, almost to the point when he doesn’t even have to check on the spray heads for long periods of time. Patch to Plate has focused on building a productive tower system out of the materials that are affordable, easy to find (or are even upcycled) and are of food grade quality. The video above (Part 1) is a step-by-step narrated slideshow about the construction of the system. 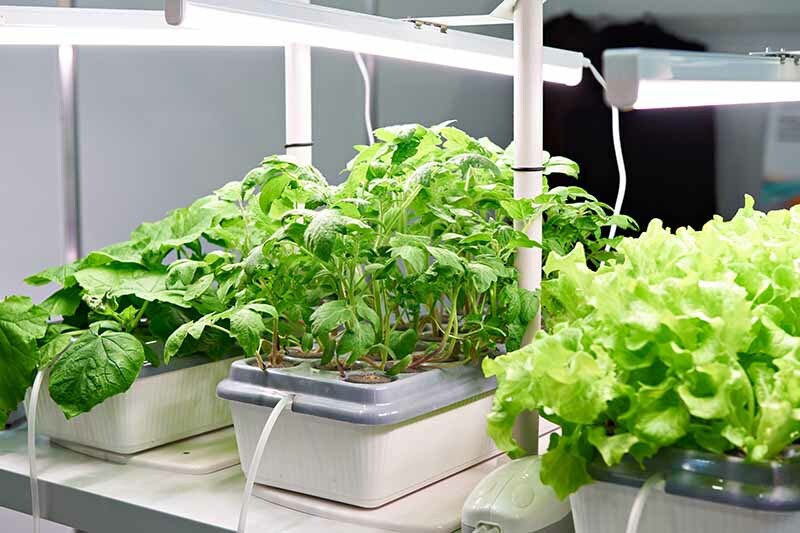 Part 2 shows a footage of a working system, growing lettuce, basil and other leafy greens and herbs; it includes additional details on spraying, misting, tubes, timer and other technical details. Also, there is an additional video on mixing nutrients for the tower. A true work of art among listed projects, the Aeroponic Tree provides 36 growing sites in a 2 square foot area. It is a tall, modular, custom-built tower, which can be lengthened if needed. The 36 planting sites are done in the style of Dutch buckets, with the empty sites covered with neoprene to stop the mist from escaping. For even more convenience, the whole tree sits on wheels so it can be moved around easily. The Four-Part video series documents the entire process of building one aeroponic tree, and can be found on the Auburn Sky Farm channel. Remember that expression “It’s so easy my kid could do it”? Well, the teens Erik, Briana, Elise and Leona surely challenge the concept. They used an ultrasonic fogger, buckets and foam as the basis for their design, which is fairly simple, but they don’t stop there. Tubes, solar power, rails and Arduino automatization - the Tribe Awesome worked all that in into their elaborate aeroponic system. The video is more like a documentary then a true how-to tutorial, but it is a nice overview of the system which provides enough details that you can incorporate into your own design. This homebuilt rail aeroponic system is used to grow 39 pepper plants. Although the video is an overview of a complete system rather than a step-by-step tutorial, for anyone who has some prior experience in building hydroponic systems, it should provide enough information. I hope that this overview of the DIY aeroponics systems was useful and inspirational for you. As you can see, there is a full range of aeroponics projects available, from those suitable for beginners, to those that require experience, and even some craftsmanship - such the Aquaponic Tree. You will easily be able to choose what is suitable for your taste and skill level. Have you ever tried an aeroponic system? Did you buy it, or tried to build your own? Let us know in the comments below!